Seemingly everyone is pulling out all of the stops this holiday season. And when it comes to unique wintry wonders, it would appear that Heathrow Airport is throwing their Santa hat into the ring. 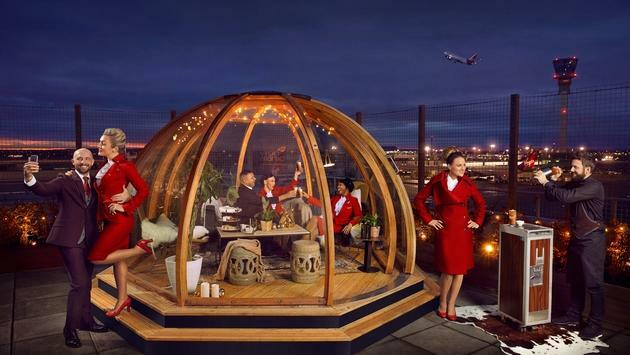 The Clubhouse—Virgin Atlantic’s glamorous airport lounge located in Terminal Three—has been given an exclusive Christmas addition in the form of a Nordic-style igloo located on its roof. The heated igloo (this is England in December, after all) can seat up to eight people and features decor that fuses Virgin’s eye-catching colors with an on-trend Nordic theme. Not many people can claim to have dined under the stars on a December evening while watching international flights takeoff and land. The igloo is a collaboration between Virgin Atlantic and nearby London hotspot the Coppa Club, who have featured the igloos on the terrace of their Tower Bridge restaurant and bar for the last two years. In fact, the igloos were so popular last year that they sold out at the Coppa Club within four hours of going on sale this year. But don’t worry, because if even if you missed out on booking your spot within one of these glass-encased “pods” along the river, then you can get a second chance as a Virgin Atlantic customer. Only this time, you’ll be drinking and dining on the roof of the airport. Daniel Kerzner, Vice President Customer Experience for Virgin Atlantic, said in a statement: “Once again we have shown what sets Virgin Atlantic apart. This winter we’re bringing the UK’s most in-demand pop-up direct to our customers by introducing an igloo on the roof of our Heathrow Clubhouse. The Clubhouse is already popular with fliers due to its brasserie restaurant, lively bar area and bespoke spa, but this collaboration with the Coppa Club is sure to have festive fliers—and plane-watchers—scrambling over themselves to grab a seat. Isabella Kirkton, Head of Marketing for Coppa Club, said: “At Coppa Club we pride ourselves on delivering amazing outside spaces and after a second successful year of Coppa Club Igloos on our terrace at Tower Bridge this unique partnership offers customers the chance to enjoy the pop up in an unexpected setting. 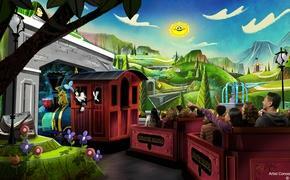 Maybe even Santa himself would be jealous of this particular view. The Heathrow Clubhouse igloo is open until 18th January 2018, and you can find out more about it here.